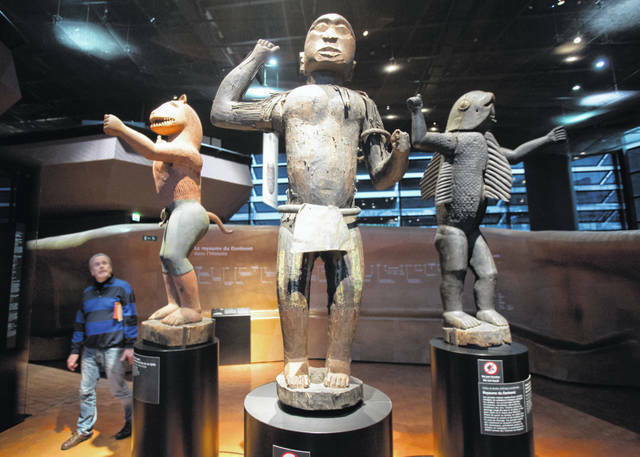 Visitors look at wooden royal statues of the Dahomey kingdom, dated 19th century, today’s Benin, at Quai Branly museum in Paris, France, on Friday. From Senegal to Ethiopia, artists, governments and museums are eagerly awaited a report commissioned by French President Emmanuel Macron on how former colonizers can return African art to Africa. PARIS — African artworks held in French museums — richly carved thrones, doors to a royal kingdom, wooden statues imbued with spiritual meaning — may be heading back home to Africa at last.